Getting ready for Open Studios always includes a lot of procrastination for me. Some prep I’ve done too early – like washing the floor, now dripped on again. Some too late – reorganising and pricing work. 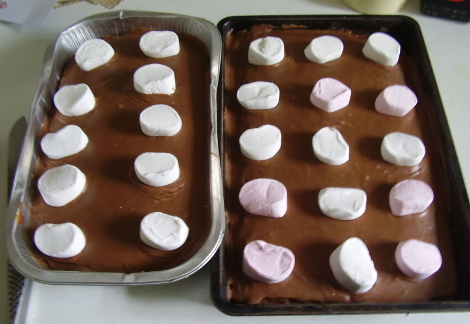 I’ve made Parkin, and, for kids of all ages, chocolate cake topped with marshmallows. I’ve used Sue at the Quince Tree Blog‘s great chocolate cake recipe, which is also great with Maltesers. So the Open Studio is Sat/Sun, 10/11 and 17/18 May, details and directions to Open Studio here, if you haven’t seen them already. I don’t often get to see other people’s Open Studios, so for all of you who can’t make it here’s a short virtual tour! Carys, you are so good at your blog. Always interesting and often provocative. Please may I buy the volcano pot on the lower stand that is perpendicular to the photo on right below, and if you have a smaller one with the same greeny slip, that is exactly what I was hoping for. Mum has just had a foot op, following 4 weeks ago a pacemaker op so I am on weekend, and week, duty, and not sure I can get over to you….. I’ve gone on line and visited you virtually. Not the same as it was all too neat, and the photos were pretty well on your blog! Wendy sent from my iPad by WiFi so please excuse spellings and silly errors, and slow reply. Thanks Elaine! I know, it’s hard when running your own studio to ever have the time to visit other artists’ open days. I’ve just had to hide a Dulwich booklet so I can see who else is around when I have a bit more time! Surprisingle few went at the Open Studio – I think people were either passing by, or coming in purpose to buy? I was talking to another artist about them, who said interest built up slowly. I used moo.com, you can get 25 different designs (1 of each), which is great dor starters. I can send you a 10% off voucher if you are interested – email me! 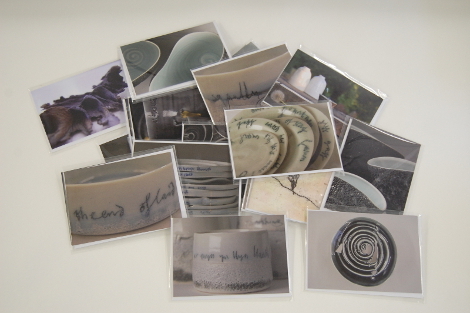 Jane – I’ve emailed you the Moo 10% offer so you have it & my email too in your inbasket! cheers!